Choose this issue for information on image sensors. the pros and cons of using LED to light up your photography, movie settings and creative styles. How effective is image stabilisation? We explore how it works and the latest developments. Various ways to achieve the popular miniature effect, including in-camera filter and TS-E lenses. A look at the pros and cons of using LEDs to light up your photography. BeetleCam can take an EOS camera into situations where a human dare not go. 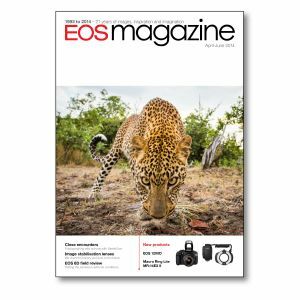 After a year of constant use, landscape photographer Graham Clark reviews the EOS 6D. Balancing daylight and flash while on location. We push the limits of Canon Picture Style Editor to create some graphic effects. Some important terms you need to understand before you shoot your first movie. Miles Willis finds photographing his home city is more rewarding than he thought possible.